First of all, your news update: Princess Sofia and Prince Carl Philip welcomed a baby boy yesterday! The baby's name and title will be announced Thursday by the King at a cabinet meeting, and the family's traditional Te Deum service will be held on Friday. Now let's turn to another Swedish birthday, in the form of our ongoing flashback to the celebrations for King Carl Gustaf's 60th birthday in 2006. We've covered the black tie private party, the hat-filled day events, and now the big show: the white tie banquet at the Royal Palace. A similar event will be held for this year's 70th birthday celebrations, but - alas! - it looks like it might be black tie. I'm prepared to cling to the tiara memories if necessary. Quite a turn out in the heads of state and consorts department a decade ago, no? 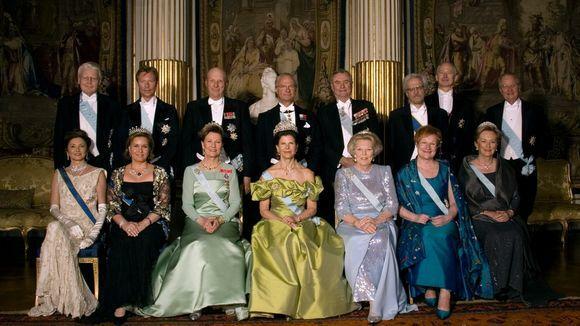 You no doubt recognize Queen Sonja's getup from Norway's latest batch of formal portraits; she paired it with the family emerald parure here back in 2006 too. Queen Beatrix turned up in glorious fashion, like a sparkly mermaid with a sarong, wearing Queen Emma's Diamond Tiara. Queen Paola wore Queen Elisabeth's Diamond Bandeau and a wrap big enough to cover most of her dress. Grand Duchess Maria Teresa turned up in what is, in my considered opinion, the most awkward piece of royal Art Deco jewelry out there. It's a sapphire and diamond necklace, and it can also be worn as a tiara, if you must. She chose a more elegant tiara, the Chaumet Pearl and Diamond Choker Tiara. As the name suggests, that one can also do necklace duty. Queen Margrethe was unable to attend, so Queen Silvia picked up the slack in the voluminous sleeve department. Well, less of a sleeve and more of a massive scrunchie wrapped around the top of the dress, I suppose. Then she balanced that out with alllllll the diamonds, including the biggest of the big guns, the Braganza Tiara. The Greek royal couple weren't in the posed photo (not being reigning sovereigns, you know), but I must throw some praise Queen Anne-Marie's way. I love this dress! Metallic and mauve are not two things I'd put together, but it's really lovely, and an excellent platform for the Greek Ruby Parure. There's no mistaking it, this is a dress for a queen. As always, this was just a selection of guests. But stay tuned: part 2 of the tiara fest - featuring the younger generation - is yet to come!